Atelier games are among my favorite JRPG games. A trilogy I spent a good amount of time playing the various games in it. Partly because their focus on the characters, something I care about a lot in stories. The stories themselves are executed well in my opinion. Despite their success, the games are still a niche compared to many gamers. Even in the Anime community, they are not that known. This is starting to change in a way, but I wonder if they are going to be mainstream someday… The games are particularly unknown in my country, I only know people who play them on the Internet (thanks Internet!). The fact they are starting to release on PC & soon the Nintendo Switch seems like it’s giving them more exposure. For the most part. The story of Atelier games tends to be simple. But still interesting to follow. It’s one example of taking a simple idea & executing it well. They are a quite of a change from other JRPG games, which tend to be about saving the world. I am not against saving our beautiful world. But that concept has been overused a little too much. Another good thing about these simple stories is that they are ordinary, and so they are a bit like our own lives. Media tends to focus much on the unordinary, famous & capable people, and so they don’t bother with these ordinary things in life. Which can be the most important things really. I wrote a summary for each of the 3 trilogy, which you can read separately. I also talked about each of the atelier games separately. This post covers the modern games on the PS3/PS4. So I will barely touch on the older games, which I haven’t played. This post will be updated once Atelier Lydie & Suelle is out. What Atelier Games Are The Best? So, What Atelier Games To Play First? How About The Plus Atelier Games? Atelier trilogy fans always disagree on which’s the better game. Each has their own order of the games. Just like I have one. I have a totally different order if I am just going to order the games based on the battle system, the story, the characters or the alchemy system. According to this poll, the Alchemy system in Escha & Logy was the most liked, and the one in Meruru follows next. Once you play all the games. You’re likely going to have a your own list. Which is likely going to be fairy different than mine. I was able to find many fans that think that Atelier Ayesha is the best just like I do, but they disagreed with me on the next best game in the trilogy. Some players liked the time limit in the Arland trilogy. Some can’t even imagine having it around. And so they are unlikely going to play some of the older games (I highly suggest you try it out yourself, while giving it enough time to judge it by yourself). Because of these differences. I will tell you what is in each game, rather than trying to sort them in a way that only suits my taste. Along with that, I will insert my opinion here & there (you will notice that I liked the Mysterious trilogy the least, for one). Alchemy:- And the ability to create things, either to achieve a goal, finish a quest or to simply use the items yourself. And in the last case, the better the quality of the items you create, the better & more powerful they will be. Slice-Of-Life:- And the interactions between the characters, this is one of the cornerstone of the Atelier games. The recurring characters between each game in any given trilogy makes things even better. Old-styled battles system:- All the Atelier games to date have a menu-based fighting system. If you are a player of old JRPG games back in the day, you may appreciate that part of them. The battles are not that slow like those old games though. Multiple Endings:- Depending on how you progressed in the story & the events you invoked, you could trigger different endings. Many of the games have an ending for each character. Some of the endings are hard to get, and that ending tends to go for the true ending. New Game+:- After you finish the game. You get a save game where you start it again, while keeping your old equipments & money, which makes things easier & more fun. The knowledge you got from the previous run can make things easier & interesting too. The games varies each of the aspects above. For one, the dusk is the best when it comes to the fights, while the slice of life aspect is generally better in Arland. The Arland trilogy is the first Atelier trilogy that comes in 3D, and they start on the PS3. It’s also the hardest trilogy among the 3 I am discussing here, mainly because they have the strictest time limit. While I loved the challenge & thought it was fun, and it’s part of why I liked the games in the first place. It can be a bit too much at times, at least until you learn how to manage your time. The time limit can be annoying at times, there were times when I had to save before I get to experiment with something so I won’t waste a precious time on that. Because Atelier Rorona is the first Atelier game that comes in 3D. It didn’t look very good because of that. The character models looked a bit too funny. But I give the developers the credit for making the jump. You play with Rorolina Frixell, nicknamed Rorona. Who had to save her master’s alchemy workshop from closure. Even though she knows nothing about alchemy. The alchemy system depends pretty much on the materials you use in order to get the traits or effects you want in your final item. The battle system in Rorona depends heavily on the items & gears you have. Create the best gear you could, even if it wasn’t optimal. Make few bombs & you’re good to go. The simplicity of the battles in Rorona is what made me like the game. It’s simple for the fun of it. I changed my mind a bit when I saw the better battles in the next few atelier games. But I still like the system in Rorona. The time limit in Rorona was a bit strict, but it’s still enough to get the true ending if you played well. In the worst case, you could get that ending in your 2nd playthrough. I had an interesting story with Atelier Rorona:- To be quite honest, I was never excited to play Rorona in the first place. I got it only because I already intended to play the whole games on the PS3 (I had a lot of free time back then). I didn’t expect to like it so much. This happened to with 2 Atelier games (the other one was Atelier Ayesha, my favorite in the trilogy). Atelier Totori revolves around Totooria Helmond’s journey to find her mother. Totori is nicknamed Totori. You probably noticed the trend of having a long & elegant name for the main character, only for it to be shortened to a cute name. Atelier Totori is the most vast Atelier game I played. And the game world just kept on getting bigger & bigger. Some of the areas are very nice to explore. Some even had really good OSTs. Totori has the most harsh time limit. It’s one of the reasons I had to replay it many times. It was fun to be able to reach more areas & achieve more in it. There are many tricks that allows you to save a lot of time I never knew about in my first playthrough, sometimes you save months at a time because of these tricks. The battles in Totori are way better than in Rorona, they feel very dynamic, and they were often more difficult than Rorona. The alchemy system is so similar too. The story scenes & the interactions in Atelier Totori were very enjoyable, especially for the recurring characters. I still remember many of them to this day. You can find one of them in the following video if you’re curious. But feel free to skip the video if you don’t want to spoil anything on yourself. The battles in Meruru were very fluid, the characters skills & moves looked good too, The battles, and specially the boss battles, are like you’re watching a fight in an Anime (Totori had that, but to a lesser degree). But for some reason. I liked the battles in Totori more. The time limit is still strict, but not as much as Totori really. It’s all about your ability to become powerful enough to beat the bosses & other enemies. Unfortunately, Atelier Meruru is the last Atelier game to follow the visual novel story-telling format, which I quite like. 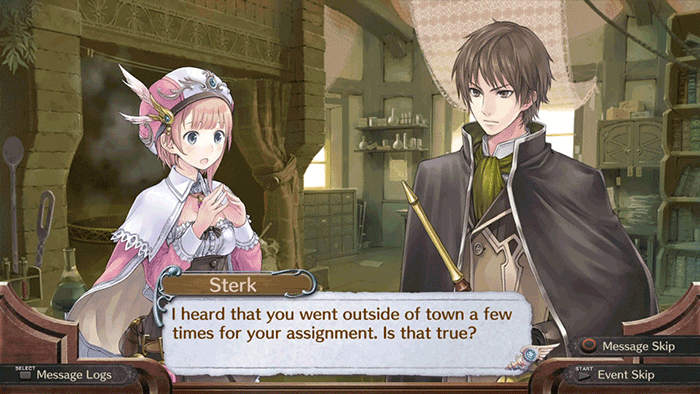 While the Dusk trilogy following the same slice-of-life style of the other Atelier games. It tried to do something different. The stories are a deeper in some sort. Even if you don’t play the Atelier games for the story at all. This could be different case with the dusk trilogy. The thing I quite didn’t like about the Dusk trilogy is that I really feel like the story is not fully explained even after the 3rd game. They set the expectations quite high, in a good way at first, only for them to ignore a good chunk of it later on. Some fans (including me) the developers said they were going to release a 4th game to continue the story if Atelier Shallie, the 3rd game in the series, sold well, which never happened. I can’t fully explain the whole thing without spoiling a lot of the story. But I may talk about it in another post dedicated to that. They can still make another game to continue on the Dusk theme if they like, or even start another trilogy for that reason. But I don’t think that’s ever going to happen. Despite the differences with the Arland trilogy. The dusk trilogy built upon the gameplay in more than a way. As you will see soon. 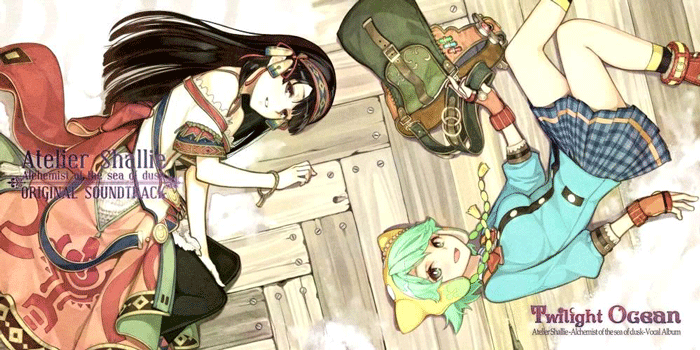 Atelier Ayesha has such an amazing story. It revolves around finding Nio, Ayesha Altugle’s sister who she thought was dead. And then the story continues from there. You wouldn’t expect much from something like that at first, but since it was executed very well, it was really worth it. Ayesha herself is a very sweet girl, you will definitely like her if you’re into that kind of characters. The other characters are really good. And as good as the ones in Arland for some of them, that’s important since the characters of the first game tend to recurs the most in the rest of the trilogy. The battle system is where your characters stand in one of the 4 positions around the enemy. You can move any character in their respective turn if you like. It’s a bit lacking in the bosses area. But there’s at least one or two that will make you pull your hair even if you’re good. The alchemy system in Ayesha is quite different than the one in the Arland trilogy. It give you more control over how to use the ingredients. That’s one of the reasons the Dusk trilogy is excels when it comes to alchemy, in my opinion. You can’t create equipments in Ayesha. But you can strengthen them using some materials. The time limit in Atelier Ayesha is so lax. To get the true ending, time is not an issue if you know what you’re doing. Since moving between different places & towns can take a lot of time if you did it a lot, and giving how there are many things to do in order to get that ending. Besides that, getting the ending is not that difficult for the most part. 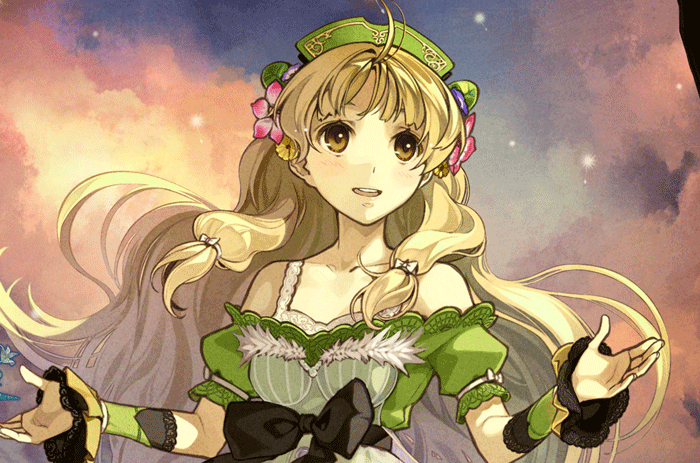 Atelier Ayesha did away from the visual novel narrative style in the Arland trilogy. I really loved that style about the Atelier games. So I miss it. I didn’t mind that much with Ayesha. Since they did the characters expressions well in it. But I still wish they bring back that style someday. Eschatology is a part of theology concerned with the final events of history, or the ultimate destiny of humanity. This concept is commonly referred to as the “end of the world” or “end times”. 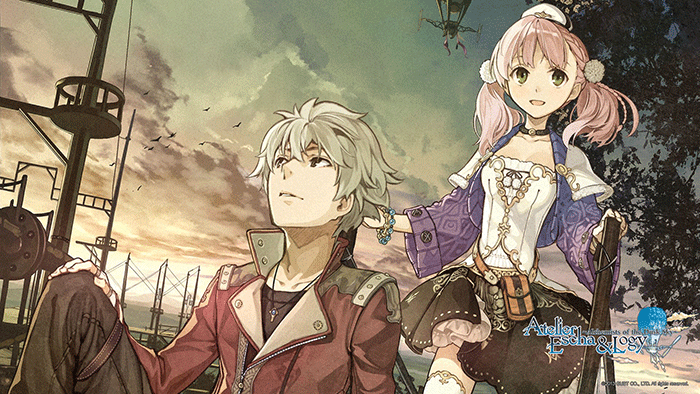 Atelier Escha & Logy is the first game mentioned here to feature two protagonists. You could play as either Escha Malier or Logix Ficsario (nicknamed Logy). Each has their own scenes and side of the story, but the main story is the same nevertheless. To get all the endings, you need to play the game twice. 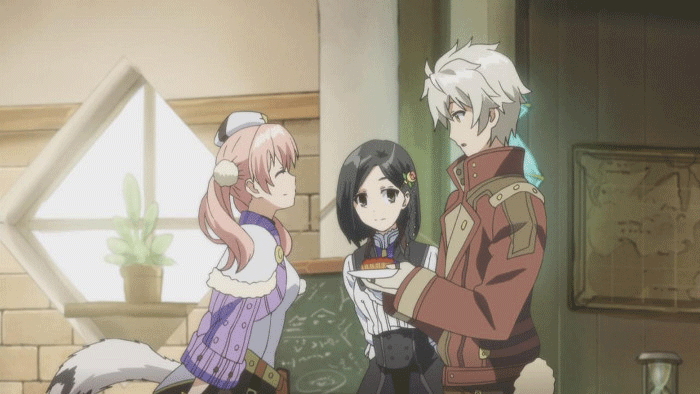 Once as Escha, and once as Logy. You may have to play the game for a 3rd time if you didn’t get all the scenes in your first gameplay. The story follows the same premise of Ayesha, and it builds on it to a degree. It was good, but not as good as the one in Ayesha. While having two protagonists was a really good change. I personally prefer to have one protagonist as the main focus. Based on the games that came after Escha & Logy, it seems like Gust is alternating between the two styles. The story in Escha & Logy is divided into chapters, and in each chapter, there are main tasks to be done. Once you finish the main tasks. You could move to the next chapter, or to try to do the optional tasks for rewards. Continuing with the trend we kept seeing in the last entries. The time limit is even more lax than Ayesha. You could finish all the main tasks and still have a time to loiter around. The only time I believe you would loss a deadline is for the optional tasks, and that can only happen once or twice in a gameplay if you managed your time well (not a hard thing to do at all in this game). The hunting & gathering spots you explore are not fancy in this game at all. It’s one of the worst games in the trilogy when it comes to that (partly due to the story, but I think it could have been better). But it still keeps the compact small areas you could explore quickly. Atelier Escha & Logy has the best battle system in my opinion. Just like the case with Meruru. It sometimes felt like I am watching a fight in an Anime. Not just that, it was quite fun to make powerful items to defeat powerful bosses in it. I quite loved the alchemy system in this game. It follows the way of Ayesha’s where you can control the quality, effects & traits of the final item using the ingredients. And to create the best items you could with that. You won’t have much control at the beginning of the game giving how you’re low on materials & skills, but you can do it later on. Atelier Shallie follows Escha & Logy’s trend of having two protagonist. It’s two girls this time. Shallistera Argo & Shallotte Elminus, and both girls are nicknamed Shallie. They also return to the habit of having a long elegant name that’s shortened in a cute way. Shallistera is a princess that wants to save her village from drought. While Shallotte wants to become a good alchemist the two games meet & end up working together. With Atelier Shallie, the time limit is totally gone. It felt nice to be able to do whatever I want at my own pace. At the same time, the removal of the time limit without adding anything to compensate for it felt wrong. I later realized that part of the fun of the Atelier games is whether you could make it before the deadline, and the joy of actually achieving your goals. There’s also a sense of progress in having that too. I am not against them making the games easier for the new players, that’s all good & cool. But they could introduce an easy mode for them instead. A mode where each of your actions cost less time than in the normal mode, or something like that. Bear in mind that the task system forces you to move to the next chapter after some time of finishing the main task. Atelier Shallie has a really good battling system, it’s among the top among the PS3/PS4 games, alongside with good OSTs as well. I personally prefer the Escha & Logy. But you won’t be disappointed in the one in this entry of the trilogy. It’s one of the reasons I am tempted to go back to it in the future once I have the time to. The alchemy system here is a simpler version of the one in Escha & Logy, and it’s good. You have a moving atelier alongside you, so you no longer need to go back to your town to synthesize anything. Which can save you a lot of time (there’s no time limit though, oops). 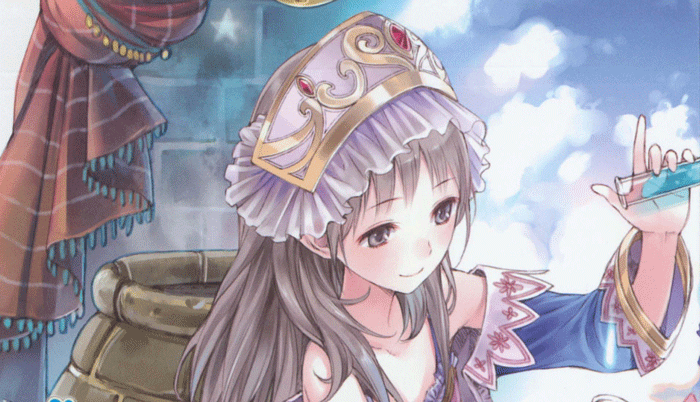 Again, Shallie is another Atelier game where it’s relatively easy to get all the endings. There are two endings for both girls that are easy to get. There’s also the true endings that you unlock by getting certain scenes. But it’s only unlocked after you finish the game twice & get the two other endings first. Either way, you need to play with the different character to see their side of the story. The main thing I don’t like with Shallie is the way they concluded the Dusk trilogy. I felt like there’s much more in the story for them to explain. I waited months for this game hoping they do that. But it was quite the disappointment. But when it comes to the gameplay & characters, it’s a good game. The Mysterious trilogy is where Atelier games first made it to the PC world. Which is something that could help it gain more exposure (not everyone own a Sony console, you know). The trilogy feels relaxing & even slow-paced. If you’re into relaxing slice-of-life Anime. Then you will sure appreciate it a lot, as they did that well, but they gave up on many things, like the deeper characters interactions, and the good battle system they already had in the Dusk trilogy. That could make them less likely appealing if you liked the previous games. The simplicity of the games also makes them a good entry point to the Atelier games (I personally think they overdid it a bit trying to appeal to the newer players). I am sure you heard this story when it comes to a lot of gaming trilogy, where an developers try to make their games more approachable to newer players, while forgetting about the old ones. The sales of Shallie was much less than the previous games. They want to cater more to the mainstream audience. Especially that the mysterious trilogy is available on PC now. The alchemy system in the mysterious trilogy is Puzzle-like synthesizing. Just like how alchemy in Dusk makes you create a good items by giving you control on how the ingredients are used. So adding these puzzles where you try to cover certain squares is what they came up with. I give Gust the credit for trying new things here. The first entry of the Mysterious trilogy follows Sophie Neuenmuller, a novice alchemist who wants to become a reliable alchemist. While she’s at that, she finds a mysterious book that talks. From there on, she tries to learn recipes in order to help the book regain its memories. The book becomes Sophie’s mentor, and each of them are helping each other along the way. 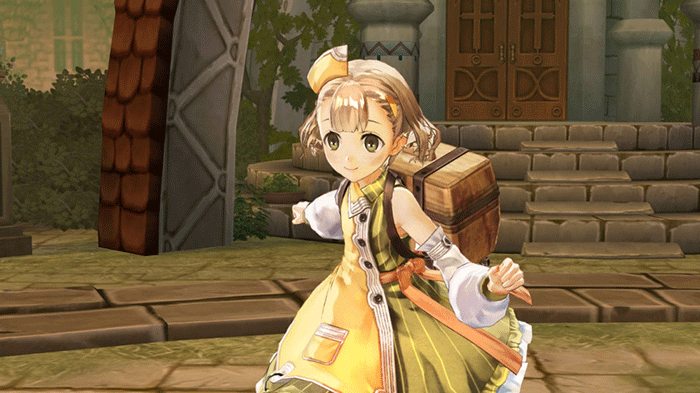 No one I know who’s new to Atelier didn’t like this game. But if you played the previous Atelier games, you may be a bit disappointed. It’s so friendly to new users. Besides two events, there’s no way to miss the characters events. Even after you finished the game, you can get any of the events at your own pace after that. There’s only one ending, sadly speaking. But there are a many optional things to do post-game. Atelier Sophie is the second Atelier game in row where you don’t have a time limit. They gives you more freedom than in Shallie. Since you need to discover recipes to progress in the story. That makes the game feels slow in certain times. I am not sure if that’s the result of the time limit removal, or just the way you play the game, which is to discover recipes. The characters in Sophie are good, but some of their stories felt a bit short. But it’s early to talk about that since the trilogy is not over yet. Since many of these characters are bound to reappear in the next two installments in the trilogy. The alchemy system involves you more in the proves, by making you choose the cauldron to use. As well as place the materials in it in a Tetris-like puzzles. You don’t really need to do that if you just want to create the item. But you can get better items if you did so. The battle system is a bit simplistic compared the previous few games. It reminds me pretty much with the one in Rorona. I don’t dislike it or anything, but I don’t understand why they didn’t keep the same good system from Shallie. One noticeable flaw about Sophie is how the monsters felt a bit repetitive, many of them are the same but had a different color. The same can be said for some of the villagers. Atelier Sophie is the first Atelier game to introduce a day & night. You could be gathering items in the field & the night falls. The music changes to relaxing tone along with that. I am not trying to bash on Sophie or say it’s a bad game. You could totally like it & appreciate many things in it. But if you’re to play it after the 6 games before it, you may feel the same way about some of the changes to it as I did. Atelier Firis is about Firis Mistlud. Who lives in Ertona, a town located inside of a mountain (I remember having one like that in Tales of Vespeira, and it looked awesome). Firis wants to leave that town to see the world. Eventually, Firis’s parents agree to let her go out on the condition she becomes a licensed alchemist within a year. That’s it in nutshell. It reminds me a bit of Atelier Totori for that reason. Both for the story and the vast world for you to explore (I still feel like the world in Totori is bigger). Because Firis has to pass the exam within a year, that’s the time limit you have for this game. It’s not strict at all. I managed to have 100+ days by the time I was ready for the exam, and I wasted a lot of time here & there. Specially at the beginning. So the time limit is not a reason for worry. 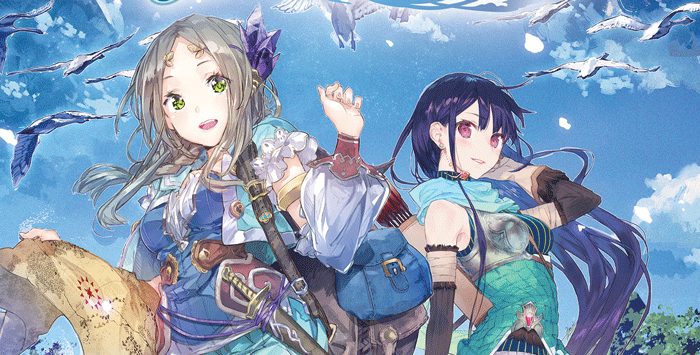 Atelier Firis follows the idea of having two protagonists, but rather than having two alchemist characters. one of them is not an alchemist at all. And here are some good news:- The mutiple endings are back in this game, maybe they realized their mistake of removing them in Sophie or something. The alchemy & synthesis in Firis builds upon the one in Sophie. You again solve a Tetris-like puzzle. This time, the grid is determined based on the catalyst you want to use, you can always synthesize with no catalyst, but you can only have 2-3 effects that never change that way. You can mash buttons to place the ingredients if you just want to create the final items without any regards on the quality. The recipe discovery system in Sophie still exists in this game. You discover new recipes by doing different kinds of things. I was able to uncover all sorts of recipes by just gathering & synthesizing around. Unlike Sophie, you don’t need the recipes primarily to proceed in the story. 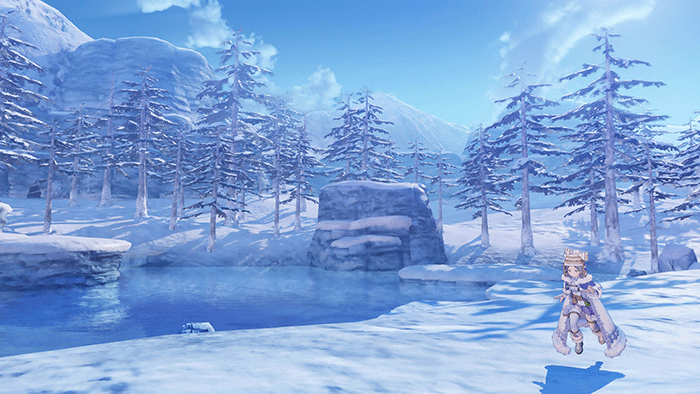 It’s an open-world game, so you progress the story at your own pace. You can do all sorts of optional quest along the way for rewards. Because of that, there’s no map from which you pick which city to go to (there’s one to show you the world as a whole, and that’s it). I am not a fan of open-world games much, I always feel like something is off when I play them. I played Nier Automata & liked it for the story & OST. I also played The Witcher 3 but never finished it, to give you an idea how I perceive these games (which mean you could like Atelier Firis a lot). One of the things I didn’t like about the gameplay in Firis is that it makes you walk a lot. Anytime I play a game, and specially a RPG game that requires you to walk a lot, I consider that a minus. I don’t see any reason for games to be realistic like that (I felt that way in Tales of Zestiria for one). To their credit, the developers give you a way to jump between various places & landmarks, which solves the problem a little bit. You can also walk faster by pressing & holding down the R1 button (or equivalent button to it in your system). Some of the many the beautiful areas in the game could make you forget about this. But for the ugly areas, or when you are in a harry to move to a certain town, not that much. Inside a lot of areas, there are caves where you can find minerals & other resources. I found these minerals to be boring, so I didn’t try to explore all of them. Besides the beautiful sceneries at times, the background musique while you explore caught my attention multiple of times, some of them were really good & made me want to stay in the area (some felt repetitive). But the fact that the musique changes every time the area changes was a bit abrupt & made this less enjoyable. I wish they made the musique uniform for every specific area. The transition in the music tone when the night fall is done well, so why they didn’t do anything similar for the field songs. If you happened to not like a certain background music, you can replace it to another from the previous Atelier games & other games (you need to download the free DLCs for). You can access the atelier in a lot of places during the game, you don’t need to go back to your hometown to synthesize. The ability to change costumes is a bit different in Firis. As each costumes has its own benefit, be it when it comes to Alchemy or exploring in certain areas. Just like the case with Sophie. The villagers felt a bit repetitive in this game. The battles are similar to it too. All in all. I think that Atelier Firis is a much better game than Sophie, and it’s worth trying yourself. If you plan on getting the game on PC, keep in mind that it has some frame rates issues. I know the game is not out in English yet. So I won’t talk much about it. But having a section for it will help me edit this article later on. This is the first entry in the Atelier trilogy that make its way to the Nintendo Switch. It will also come on PS4, as well the PS Vita (in Japan only, they seem to abandon westerner players who only have a PS Vita & played the previous games in the Mysterious trilogy). Giving the differences between the two systems, the PS4 version looks much better (see the video below). But you can’t beat the portability of the Switch version in my opinion. The Switch version is the one I pre-ordered by the time of writing this post. From the videos & pictures I saw. The characters design is so good. The best in the mysterious trilogy so far. The theme of a painting is also good. It goes along the book in Sophie. So far, it feels like the mysterious trilogy lacks a common theme. An issue the previous trilogy never suffered from. For the reason, I hope that Lydie & Suelle fixes that. I hope they improve more on Firis on this game. From the videos I watched, there doesn’t seem like there’s going to be less walking in it, and I really hope I am right. Seeing how the Japanese already played this game makes me wish I could dedicate more time for my Japanese studies…. Uguu. Since there are so many Atelier games here, you may be wondering which order to start playing with. While you could play any trilogy as a stand-alone. Playing them in a certain order can provide you with a better experience. There are two suggested order to go with. For one, you could play them in the order they came out. To see how the trilogy evolved. That’s the one I picked up myself, and I was satisfied by it. If you’re going to start with Atelier Rorona Plus. Then you can keep the post-game contents to after you finish the Arland trilogy. 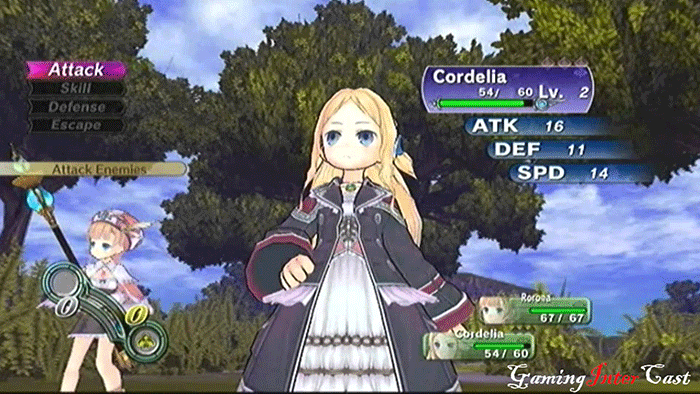 Another option is to start from the Mysterious trilogy, then play the Arland trilogy, then Dusk. Since the Mysterious is friendly with newcomers. But that way, there’s a chance you may not be ready for the time limit that’s going to be imposed on you in the Arland & Dusk trilogy, or because you only have a PC for now. If you only have the time to play only one trilogy. I suggest the Arland trilogy. If you’re a mainly a PC gamer. You have no choice but to start with Sophie. If you only plan to play one or two Atelier games. Then it will be much harder to recommend a game. But I suggest Ayesha & Totori. The best two games in their corresponding trilogy. Each of the Atelier games in the Arland & Mysterious trilogy has a plus version. Mostly on the PS Vita (With the exception of Atelier Rorona Plus, which is available on the PS3). The plus versions Come with all the downloadable contents you have to get separately in the PS3/PS4. Atelier Ayesha & Escha And Logy has extra bosses, the Alchemy system in Totori plus had some of the improvements from Meruru (credit to andyscout for giving me these information). Atelier Rorona Plus:- This one has a lot more added compared to the original version. The graphics were vastly improved, the alchemy was vastly enhanced too. It also adds a post game contents. It’s worth noting that Atelier Rorona Plus was called “New Rorona” in Japan. Atelier Ayesha Plus:- The Hard Mode was added. Had additional bosses & art gallery/achievement-system-of-sorts with some minor quality of life improvements, The English version has dual audio, which matters a lot for some people (the PS3 version of Ayesha is the only one audio). Atelier Escha & Logy Plus:- Minor quality of life improvements, added events that that makes you see how the relationships between Escha & Logy is (romantic or platonic). Atelier Shallie Plus:- Had significant tweaks to certain event progression (to include Ayesha and Logy, which were added to this version). This plus version has additional ending contents to wrap up the Dusk series better. I am yet to play it, but I have plans to get to it. While that’s good & all I feel like advising you not to get the Vita versions, as they can have long loading times & frame rates issues. That was the case for me with Atelier Ayesha plus. Bear in mind that the Mysterious games, Sophie & Firis, didn’t have a plus version. The plus versions can be played on PS TV too. In my opinion. Atelier games deserve more exposure. At least among JRPG & Anime fans, since they provide a very unique experience compared to a lot of similar games I played. As a last statement. I have something to ask of you. If you are hesitant about playing the older Atelier games because of the time limit. Please reconsider that decision. They are a really good games. And the time limit in many of these games is manageable. Specially in the Dusk trilogy. That specially goes if you’re the kind that enjoys planning & managing things. Which System did you like synthesizing the most? The first game I played was Sophi … and I couldnt finish it the first time, I got super bored xD after I while I played Rorona, and gosh Im so happy I played Rorona, because of her game I could experience the joy in this games.